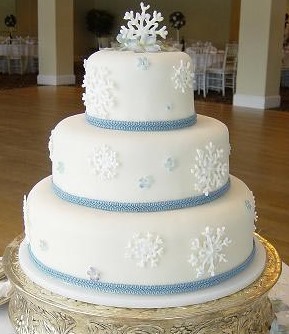 An example of ribbon around a fondant cake. What is the best way to attach ribbon to cake? For satin ribbon-Iron the back with waxed paper before attaching. To glue the ribbon use small dabs of royal icing (for a fondant cake). You may need to attach the ribbon a few inches at a time. For buttercream icing it is a little trickier as the frosting is greasy. You will have to make sure that you don't get any on the outside surface of the ribbon. Use the same method of ironing waxed paper onto the back of the ribbon before applying it to the cake. Put the seam at the back and attach the ends with royal icing. You may have to cover that spot with a flower or decoration of some kind. The example above is a fondant cake with a textured weaved ribbon that I purchased at Joannes Fabrics sewing store. Another option is a fondant ribbon. The fondant ribbon is easier to use then a fabric one. You can use it with BC or a fondant cake and it will mold a little to the cake as well. Hope that answers your "attaching ribbon to a cake" question. My question to you is, "Would you use the same method and type of ribbon on Marzipan covered cakes as you would for Fondant covered cakes?" what are the directions for ironing wax paper on to the back of the ribbon? I tried it, but I must be doing it wrong because nothing happened. :( thanks for your help!! Hi Traci When you iron the waxed paper the wax will be transported to the ribbon, The paper is then removed. And Yolanda I realize that I missed your question somehow. The answer to your question is you could use this method to protect the marzipan from any dies in the ribbon and Marzipan is oily. The oil may cause a problem with the ribbon if you do not protect the ribbon from the Marzipan as well, so I would say YES. What kind of ribbon to you put around a cake? I need to put a ribbon around the base of a cake, however, I would think that it would get grease spots on it rather quickly. 1. What kind of ribbon do you use? 2. Does the icing have to be fondant? 3. Do you put the ribbon on after delivering the cake to the reception. Here are two posts that answers your question attaching ribbon to a cake and attaching a ribbon to buttercream. The first post is more detailed and talks about ribbon on fondant and buttercream. The second one deals more with buttercream. If using buttercream put your ribbon on when the cake is cold. You don't have to wait until you get to the reception. Hope that helps you out.. Comments for What kind of ribbon to you put around a cake? Hi Otiku, Good question. You can make ribbon using gumpaste or fondant, and you can also use fabric ribbon. The fabric ribbon works well over a fondant cake, not as easy with a buttercream cake as the ribbon can absorb the grease and get splotchy looking. Attaching a ribbon to buttercream. bleed onto the buttercream. Should I place a towel on the ribbon before ironing it to the wax paper and will the wax alone adhere to it? could I back it with wafer paper and piping gel instead? Yes you can use a thin towel between the iron and the ribbon if you are worried about the iron ruining the ribbon, but I don't think it's necessary. The waxed paper will stick to the ribbon and acts as a waterproofing and grease resistance from the oil in the butter cream. The oils will bleed through the ribbon and make it look blotchy otherwise. I have not tried wafer paper, but i think even piping gel is too risky to use as a glue between the wafer paper and the ribbon. Hope that helps you out. I am so pleased I found your site! You are so welcome. I am glad you found my site too. :-) Good luck and happy baking and cake decorating. Comments for Attaching a ribbon to buttercream. THANKS FOR THE INFORMATION ABOUT IRONING WAX PAPER.